The first known description of neonatal brachial plexus palsy (BPP) dates from 1779 when Smellie reported the case of an infant with bilateral arm weakness that resolved spontaneously within a few days after birth. In the 1870s, Duchenne and Erb described cases of upper trunk nerve injury, attributing the findings to traction on the upper trunk, now called Erb's palsy (or Duchenne-Erb's palsy). In 1885, Klumpke described injury to the C8-T1 nerve roots and the nearby stellate ganglion that now bears her name. Numerous other nonsurgical treatments, including electrical stimulation and botulinum toxin injections, also may prove effective in the treatment of children with BPP. In view of the variability in presentation, treatment options, and outcome measures, a multidisciplinary approach to the care of the infant with BPP is recommended. To understand the clinical presentation of brachial plexus palsy (BPP) and provide anticipatory guidance for families affected by the condition, the clinician must first know basic anatomy. 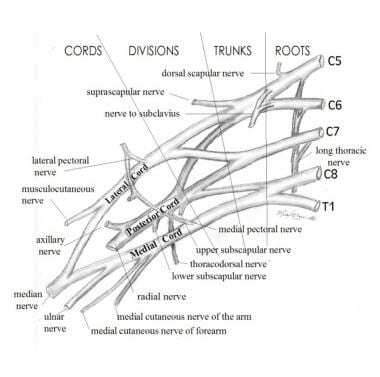 As seen in the image below, the brachial plexus consists of nerves (the ventral rami) from C5-T1. Brachial Plexus. Image courtesy of Michael Brown, MD. C5 and C6 join to form the upper trunk, C7 travels alone as the middle trunk, and C8-T1 join as the lower trunk. Each trunk divides into anterior and posterior divisions to create the cords, which then subdivide further into branches that supply the muscles of the arm. Injuries of the brachial plexus may be mild, with only temporary sequelae, or devastating, leaving the child with a flaccid, insensate arm. Erb's palsy affects nerves arising from C5 and C6. Upper-middle trunk BPP involves nerve fibers from C5, C6, and C7 levels. Klumpke palsy results in deficits at levels C8 and T1, although many clinicians agree that pure C8-T1 injuries do not occur in infants and may be indicative of spinal cord injury (SCI). Total BPP affects nerves at all levels (C5-T1). Bilateral BPP demonstrates bilateral involvement. When defining the severity of a peripheral nerve injury, differentiation between neurapraxic, axonotmetic, and neurotmetic lesions is helpful. Purely neurapraxic lesions do not affect the axon itself. These lesions generally are reversible and do not leave sequelae. Axonotmetic lesions involve disruption of the myelin sheath and the axon, leading to degeneration of the axon distal to the injury. The connective tissue across the lesion remains intact. These injuries improve gradually over 4-6 months, depending on the level of the lesion. Neurotmetic lesions are the most severe, destroying not only the axon and myelin, but also the supporting structures across a nerve. As the proximal end of the nerve attempts to regenerate without this supportive connective tissue, a neuroma may develop. The extent of improvement in the patient's condition depends on the ultimate number of nerve fibers that reconnect distal to the neuroma. Muscle atrophy from a neurotmetic lesion begins 3-6 months after injury and by 1.5-2 years is irreversible. Although the traditional mechanism of injury is lateral neck flexion, the upper rootlets (C5-C7) are 25% as likely to be avulsed as the lower roots (C7-T1). The upper roots (C5-C6), however, are far more likely to be ruptured (88%) because of the anatomy of the transverse processes and the degree of flexibility at that level. The clinician must also distinguish neonatal BPP from traumatic BPP in older children and adults. The damage in neonates usually results from slow traction injuries, unlike the high-energy shearing type of trauma seen in older individuals. Not only are the latter injuries often more severe, but with similar injuries, infants show a better functional outcome. This clinical observation is confirmed by Vredeveld and colleagues, who studied 14 infants and 19 adults with surgical evidence of complete avulsion of the C5-C6 roots or upper trunk. Electromyography (EMG) showed normal recruitment of biceps and deltoid in the infants and complete denervation in the older individuals. When C7 also was torn, the infants demonstrated complete denervation. Vredeveld and coworkers attributed this observation to neonatal C7 innervation of the biceps and deltoid that subsequently was lost if the C5-C6 roots were functional. Studies in France and Saudi Arabia have suggested an incidence of 1.09-1.19 cases of brachial plexus palsy per 1000 live births. The incidence of permanent impairment is 3-25%. The rate of recovery in the first few weeks is a good indicator of final outcome. Complete recovery is unlikely if no improvement is noted in the first 2 weeks of life. Eng and colleagues examined 191 infants with brachial plexus palsy. Nearly half of them (49%) were male, and 51% were female. Neonatal brachial plexus palsy is noted at birth. Duchenne GBA. De L'Electrisation Localise et de Son Application a La Pathologie et La Therapeutique. JB Balliere. 1872. 357-62. Heise CO, Martins R, Siqueira M. Neonatal brachial plexus palsy: a permanent challenge. Arq Neuropsiquiatr. 2015 Sep. 73 (9):803-8. [Medline]. [Full Text]. Vredeveld JW, Blaauw G, Slooff BA, et al. The findings in paediatric obstetric brachial palsy differ from those in older patients: a suggested explanation. Dev Med Child Neurol. 2000 Mar. 42(3):158-61. [Medline]. Gilbert WM, Nesbitt TS, Danielsen B. Associated factors in 1611 cases of brachial plexus injury. Obstet Gynecol. 1999 Apr. 93(4):536-40. [Medline]. Weizsaecker K, Deaver JE, Cohen WR. Labour characteristics and neonatal Erb's palsy. BJOG. 2007 Aug. 114(8):1003-9. [Medline]. Eng GD, Binder H, Getson P, O''Donnell R. Obstetrical brachial plexus palsy (OBPP) outcome with conservative management. Muscle Nerve. 1996 Jul. 19(7):884-91. [Medline]. Zuarez-Easton S, Zafran N, Garmi G, Hasanein J, Edelstein S, Salim R. Risk factors for persistent disability in children with obstetric brachial plexus palsy. J Perinatol. 2017 Feb. 37 (2):168-71. [Medline]. Huang YG, Chen L, Gu YD, et al. Histopathological basis of Horner's syndrome in obstetric brachial plexus palsy differs from that in adult brachial plexus injury. Muscle Nerve. 2008 May. 37(5):632-7. [Medline]. Jennett RJ, Tarby TJ, Kreinick CJ. Brachial plexus palsy: an old problem revisited. Am J Obstet Gynecol. 1992 Jun. 166(6 Pt 1):1673-6; discussion 1676-7. [Medline]. Allen RH, Gurewitsch ED. Temporary Erb-Duchenne palsy without shoulder dystocia or traction to the fetal head. Obstet Gynecol. 2005 May. 105(5 Pt 2):1210-2. [Medline]. Gherman RB, Ouzounian JG, Miller DA, et al. Spontaneous vaginal delivery: a risk factor for Erb''s palsy?. Am J Obstet Gynecol. 1998 Mar. 178(3):423-7. [Medline]. Raio L, Ghezzi F, Di Naro E, et al. Perinatal outcome of fetuses with a birth weight greater than 4500 g: an analysis of 3356 cases. Eur J Obstet Gynecol Reprod Biol. 2003 Aug 15. 109(2):160-5. [Medline]. Alfonso DT. Causes of neonatal brachial plexus palsy. Bull NYU Hosp Jt Dis. 2011. 69(1):11-6. [Medline]. Mollberg M, Hagberg H, Bager B, et al. High birthweight and shoulder dystocia: the strongest risk factors for obstetrical brachial plexus palsy in a Swedish population-based study. Acta Obstet Gynecol Scand. 2005 Jul. 84(7):654-9. [Medline]. Somashekar DK, Di Pietro MA, Joseph JR, Yang LJ, Parmar HA. Utility of ultrasound in noninvasive preoperative workup of neonatal brachial plexus palsy. Pediatr Radiol. 2015 Dec 30. [Medline]. van der Holst M, Groot J, Steenbeek D, Pondaag W, Nelissen RG, Vliet Vlieland TP. Participation restrictions among adolescents and adults with neonatal brachial plexus palsy: the patient perspective. Disabil Rehabil. 2017 Sep 24. 1-9. [Medline]. Bergman D, Rasmussen L, Chang KW, Yang LJ, Nelson VS. Assessment of Self-Determination in Adolescents with Neonatal Brachial Plexus Palsy. PM R. 2018 Jan. 10 (1):64-71. [Medline]. Sever JW. Obstetric paralysis: report of eleven hundred cases. JAMA. 1925. 85:1862. Malessy MJ, Pondaag W. Nerve surgery for neonatal brachial plexus palsy. J Pediatr Rehabil Med. 2011 Jan 1. 4(2):141-8. [Medline]. Vekris MD, Lykissas MG, Beris AE, et al. Management of obstetrical brachial plexus palsy with early plexus microreconstruction and late muscle transfers. Microsurgery. 2008. 28(4):252-61. [Medline]. Yilmaz K, Caliskan M, Oge E, et al. Clinical assessment, MRI, and EMG in congenital brachial plexus palsy. Pediatr Neurol. 1999 Oct. 21(4):705-10. [Medline]. Clarke HM, Al-Qattan MM, Curtis CG, et al. Obstetrical brachial plexus palsy: results following neurolysis of conducting neuromas-in-continuity. Plast Reconstr Surg. 1996 Apr. 97(5):974-82; discussion 983-4. [Medline]. Konig RW, Antoniadis G, Borm W, et al. Role of intraoperative neurophysiology in primary surgery for obstetrical brachial plexus palsy (OBPP). Childs Nerv Syst. 2006 Jul. 22(7):710-4. [Medline]. Squitieri L, Steggerda J, Yang LJ, Kim HM, Chung KC. A national study to evaluate trends in the utilization of nerve reconstruction for treatment of neonatal brachial plexus palsy [outcomes article]. Plast Reconstr Surg. 2011 Jan. 127(1):277-83. [Medline]. Kawano K, Nagano A, Ochiai N, et al. Restoration of elbow function by intercostal nerve transfer for obstetrical paralysis with co-contraction of the biceps and the triceps. J Hand Surg Eur Vol. 2007 Aug. 32(4):421-6. [Medline]. Chang KWC, Wilson TJ, Popadich M, Brown SH, Chung KC, Yang LJS. Oberlin transfer compared with nerve grafting for improving early supination in neonatal brachial plexus palsy. J Neurosurg Pediatr. 2018 Feb. 21 (2):178-84. [Medline]. Heise CO, Siqueira MG, Martins RS, Foroni LH, Sterman-Neto H. Distal nerve transfer versus supraclavicular nerve grafting: comparison of elbow flexion outcome in neonatal brachial plexus palsy with C5-C7 involvement. Childs Nerv Syst. 2017 Sep. 33 (9):1571-4. [Medline]. Terzis JK, Kostas I. Vein grafts used as nerve conduits for obstetrical brachial plexus palsy reconstruction. Plast Reconstr Surg. 2007 Dec. 120(7):1930-41. [Medline]. Aszmann OC, Korak KJ, Kropf N, et al. Simultaneous GDNF and BDNF application leads to increased motoneuron survival and improved functional outcome in an experimental model for obstetric brachial plexus lesions. Plast Reconstr Surg. 2002 Sep 15. 110(4):1066-72. [Medline]. Aszmann OC, Winkler T, Korak K, et al. The influence of GDNF on the timecourse and extent of motoneuron loss in the cervical spinal cord after brachial plexus injury in the neonate. Neurol Res. 2004 Mar. 26(2):211-7. [Medline]. Gilbert A, Razaboni R, Amar-Khodja S. Indications and results of brachial plexus surgery in obstetrical palsy. Orthop Clin North Am. 1988 Jan. 19(1):91-105. [Medline]. Chuang DC, Mardini S, Ma HS. Surgical strategy for infant obstetrical brachial plexus palsy: experiences at Chang Gung Memorial Hospital. Plast Reconstr Surg. 2005 Jul. 116(1):132-42; discussion 143-4. [Medline]. Haerle M, Gilbert A. Management of complete obstetric brachial plexus lesions. J Pediatr Orthop. 2004 Mar-Apr. 24(2):194-200. [Medline]. Laurent JP, Lee RT. Birth-related upper brachial plexus injuries in infants: operative and nonoperative approaches [see comments]. J Child Neurol. 1994 Apr. 9(2):111-7; discussion 118. [Medline]. Strombeck C, Krumlinde-Sundholm L, Forssberg H. Functional outcome at 5 years in children with obstetrical brachial plexus palsy with and without microsurgical reconstruction. Dev Med Child Neurol. 2000 Mar. 42(3):148-57. [Medline]. McNeely PD, Drake JM. A systematic review of brachial plexus surgery for birth-related brachial plexus injury. Pediatr Neurosurg. 2003 Feb. 38(2):57-62. [Medline]. Grossman JA, Price AE, Tidwell MA, et al. Outcome after later combined brachial plexus and shoulder surgery after birth trauma. J Bone Joint Surg Br. 2003 Nov. 85(8):1166-8. [Medline]. [Full Text]. O'Brien DF, Park TS, Noetzel MJ, et al. Management of birth brachial plexus palsy. Childs Nerv Syst. 2006 Feb. 22(2):103-12. [Medline]. van der Holst M, van der Wal CW, Wolterbeek R, Pondaag W, Vliet Vlieland TP, Nelissen RG. Outcome of secondary shoulder surgery in children with neonatal brachial plexus palsy with and without nerve surgery treatment history: A long-term follow-up study. J Rehabil Med. 2016 Jul 18. 48 (7):609-17. [Medline]. Chuang DC, Ma HS, Wei FC. A new strategy of muscle transposition for treatment of shoulder deformity caused by obstetric brachial plexus palsy. Plast Reconstr Surg. 1998 Mar. 101(3):686-94. [Medline]. Price A, Tidwell M, Grossman JA. Improving shoulder and elbow function in children with Erb''s palsy. Semin Pediatr Neurol. 2000 Mar. 7(1):44-51. [Medline]. Waters PM, Peljovich AE. Shoulder reconstruction in patients with chronic brachial plexus birth palsy. A case control study. Clin Orthop Relat Res. 1999 Jul. 144-52. [Medline]. Terzis JK, Papakonstantinou KC. Outcomes of scapula stabilization in obstetrical brachial plexus palsy: a novel dynamic procedure for correction of the winged scapula. Plast Reconstr Surg. 2002 Feb. 109(2):548-61. [Medline]. El-Gammal TA, Saleh WR, El-Sayed A, et al. Tendon transfer around the shoulder in obstetric brachial plexus paralysis: clinical and computed tomographic study. J Pediatr Orthop. 2006 Sep-Oct. 26(5):641-6. [Medline]. Bae DS, Waters PM, Zurakowski D. Reliability of three classification systems measuring active motion in brachial plexus birth palsy. J Bone Joint Surg Am. 2003 Sep. 85-A(9):1733-8. [Medline]. Curtis C, Stephens D, Clarke HM, et al. The active movement scale: an evaluative tool for infants with obstetrical brachial plexus palsy. J Hand Surg [Am]. 2002 May. 27(3):470-8. [Medline]. Huffman GR, Bagley AM, James MA, et al. Assessment of children with brachial plexus birth palsy using the Pediatric Outcomes Data Collection Instrument. J Pediatr Orthop. 2005 May-Jun. 25(3):400-4. [Medline]. Michaud LJ, Louden EJ, Lippert WC, et al. Use of Botulinum Toxin Type A in the Management of Neonatal Brachial Plexus Palsy. PM R. 2014 May 2. [Medline]. Buchanan PJ, Grossman JAI, Price AE, Reddy C, Chopan M, Chim H. The Use of Botulinum Toxin Injection for Brachial Plexus Birth Injuries: A Systematic Review of the Literature. Hand (N Y). 2018 Mar 1. 1558944718760038. [Medline]. Hems TEJ, Savaridas T, Sherlock DA. The natural history of recovery of elbow flexion after obstetric brachial plexus injury managed without nerve repair. J Hand Surg Eur Vol. 2017 Sep. 42 (7):706-9. [Medline]. Papazian O, Alfonso I, Yaylali I, et al. Neurophysiological evaluation of children with traumatic radiculopathy, plexopathy, and peripheral neuropathy. Semin Pediatr Neurol. 2000 Mar. 7(1):26-35. [Medline]. Buitenhuis SM, Pondaag W, Wolterbeek R, Malessy MJA. Sensibility of the Hand in Children With Conservatively or Surgically Treated Upper Neonatal Brachial Plexus Lesion. Pediatr Neurol. 2018 May 11. [Medline]. Michelow BJ, Clarke HM, Curtis CG, et al. The natural history of obstetrical brachial plexus palsy. Plast Reconstr Surg. 1994 Apr. 93(4):675-80; discussion 681. [Medline]. Waters PM. Comparison of the natural history, the outcome of microsurgical repair, and the outcome of operative reconstruction in brachial plexus birth palsy. J Bone Joint Surg Am. 1999 May. 81(5):649-59. [Medline]. Smith NC, Rowan P, Benson LJ, et al. Neonatal brachial plexus palsy. Outcome of absent biceps function at three months of age. J Bone Joint Surg Am. 2004 Oct. 86-A(10):2163-70. [Medline]. Fisher DM, Borschel GH, Curtis CG, et al. Evaluation of elbow flexion as a predictor of outcome in obstetrical brachial plexus palsy. Plast Reconstr Surg. 2007 Nov. 120(6):1585-90. [Medline]. Butler L, Mills J, Richard HM, Riddle R, Ezaki M, Oishi S. Long-term Follow-up of Neonatal Brachial Plexopathy: Psychological and Physical Function in Adolescents and Young Adults. J Pediatr Orthop. 2017 Sep. 37 (6):e364-8. [Medline]. van de Bunt F, Pearl ML, Lee EK, Peng L, Didomenico P. Analysis of normal and dysplastic glenohumeral morphology at magnetic resonance imaging in children with neonatal brachial plexus palsy. Pediatr Radiol. 2017 Sep. 47 (10):1337-44. [Medline]. [Full Text]. Chang KW, Austin A, Yeaman J, et al. Health-Related Quality of Life Components in Children With Neonatal Brachial Plexus Palsy: A Qualitative Study. PM R. 2017 Apr. 9 (4):383-91. [Medline].